Ready to use as stuffing. Consume soon after opening. Allergy Advice: Contains Wheat Gluten, Coconut, Soybean. 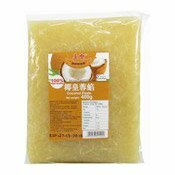 Ingredients: Winter Melon, Coconut (20%), Sugar, Wheat Starch (Gluten), Soybean Oil. Simply enter your details below and we will send you an e-mail when “Coconut Paste (康樂椰皇蓉餡)” is back in stock!